Derry~Londonderry~Doire Arrives in Australia | SCENE! Derry~Londonderry~Doire has clinched second place into Albany, Western Australia, at the end of Race 3 across the Southern Ocean from Cape Town, South Africa, in the Wardan Whip. It crossed the line at 0932 UTC (1732 local) within twelve hours of first placed LMAX Exchange in the tenth edition Clipper 2015-16 Round the World Yacht Race. The race was a typical Southern Ocean leg, with the fleet enduring a storm as it left Table Bay and taking a battering. The choices made in those first 36 hours shaped the race for a lot of the teams, with the top three yachts enduring it well and keeping up a lot of sail during the storm. They eventually had a lead of 1000 miles on the backmarkers. Derry~Londonderry~Doire finishes second in the Wardan Whip from Cape Town, South Africa to Albany, Australia. All the boats reported boat-breaking conditions with gusts of 70-80 knots on several occasions, extremely confused seas and waves of 8-10 metres during the race. The Northern Irish sponsored team has been engaged in a nail-biting duel with Chinese rival Qingdao over the last 24 hours. Its better wind angle enabled it to overtake Qingdao which had to tack and lose its advantage in the process. Daniel added: ‘We had been ahead of Qingdao, but there was a big area of light wind coming into Albany, so there were big tactical decisions the last few days about which way to go to try and pass that area of low wind, and it was very frustrating. 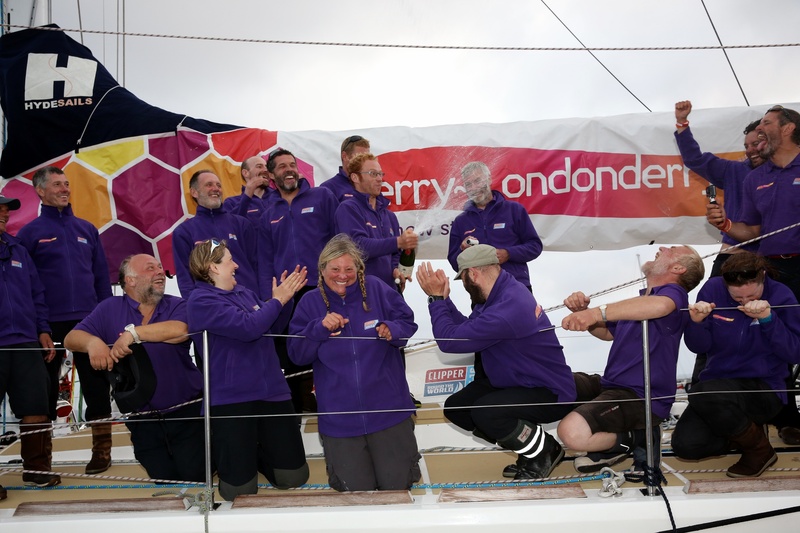 Derry~Londonderry~Doire also clinched two bonus points by winning the Ocean Sprint in the closing stages of this challenging 4850 nautical mile ‘sleigh ride’ across one of the most notorious oceans on the planet as it braved a series of storms in the infamous Roaring Forties. Mayor of Derry City and Strabane District Council Cllr Elisha McCallion has sent her congratulations to the Skipper and crew of the Derry~Londonderry~Doire yacht on securing second place in Leg 3. Extending her best wishes on behalf of the people of the city and district, the Mayor said: ‘Each and every member of the Derry~Londonderry~Doire team should be extremely proud, this is a massive achievement. Everyone here at home is absolutely delighted that they have secured another podium place. ‘We are very proud to be an Official Race Partner and Host Port, and hugely excited as we eagerly follow the Clipper Race fleet ahead of its arrival here next July for the Foyle Maritime Festival celebrations. Our participation in the race is a fantastic opportunity for us to promote our city and region, and the team is doing a great job of that by telling our good news story and securing podium finishes. Well done to everyone involved and good luck in the next leg of the race,’ she added. Leg 3 crew member Jo Hillan, from Belfast, said the team had an absolutely fabulous time. ‘It was just over three weeks of fun, madness, laughter, lots of good times, lots of very hard times. But we are very glad to be here, and so excited to be second. It wasn’t quite the sleigh ride we were all expecting, but we did quite a bit of surfing, and there was quite a bit of beating at the beginning and the end, and it was hard doing everything at 45 degrees. ‘We thought we had lost our second position to Qingdao over the last few days with the wind hole, but having got it back, it has been great for everybody. Once we knew we had that edge, we knew we had a bit more fight left in us to get it back, and it really spurred everyone on. ‘The cold was very hard, no amount of gloves seem to help, but we survived. We have had lots of boats come out to meet us here in Albany, the locals are very friendly, and we have beers waiting for us so we are very happy,’ she added. The 4845 nautical mile Southern Ocean crossing to Western Australia, was named by host port Albany the ‘Wardan Whip’ – inspired by the traditional native Noongar language which means ‘ocean of southern winds’. The team will now enjoy the stopover in Host Port Albany, where various public and crew events are planned. Joining the crew there is David Pollock, the first of five people to have been awarded a place on the race through the Derry City and Strabane District Council bursary schemes. David, 31, from Eglington will take part in Leg 4 which involves three races, the first of those is to Sydney, after which the whole fleet participates in the famous Sydney-Hobart Race and will finish the final stage at Airlie Beach, Queensland.